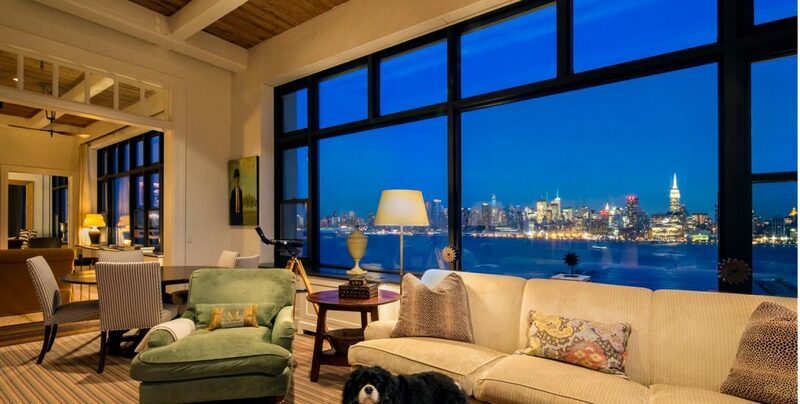 Eli Manning has put up his luxury condo in New Jersey, and it sold for a record $3.55 million. The NY Giants quarterback is now not only known for breaking records on the field but can now add another record to his list – for selling the highest priced condo in New Jersey. This three-bedroom, three-and-a-half-bathroom luxury Eli Manning home is based on the Hoboken waterfront and was sold for a record $3.55 million by the two-time Super Bowl MVP. This was confirmed by Sotheby’s International Realty, who represented the buyer. This luxury condo in New Jersey was created by combining three separate units in the Hudson Tea Building, and it is situated on the southeast corner at 1500 Hudson Avenue. As a result, this luxury condo/penthouse boasts a massive 3,555 square feet. Courtenay Batcha, an agent for Prominent Properties Sotheby’s International Realty said, “The attention to detail and the architectural design in bringing these three condos together was extraordinary and it’s a rare loft style property, meaning you have 13-foot ceilings throughout.” If you couple this with the fact that it has a prime location and is only a short walk from the bus line or ferry to Manhattan, you’ve got a very unique property. This is part of the reason why it broke the previous record of $3.3 million back in 2015. Batcha added, “If you’re looking for a comparable, you can’t find a comparable that’s 3,500 square feet in a doorman building right on the water in such a fantastic location.” Which might have made it a good candidate for an luxury auction. Manning and his family lived in the luxury condo in New Jersey from 2008 to 2016, before deciding they need a bigger home. Nevertheless, the apartment is definitely not short on space, plus it’s a corner unit with beautiful views over the Hudson River and NYC skyline. The kitchen has a lot of cupboard space, with a breakfast nook and cabinets that stretch all the way to the ceiling. The home is very modern with a rustic look, along with brick walls and beamed ceilings. This building was erected in 1913 and was originally the home of the Lipton Tea company. There are three bedrooms in total, of which two can be found in the ‘guest wing’, as well as two full bathrooms, an office and a laundry area. Past residents of this building include “The Bachelor” star Jesse Palmer, former Giants star Jeremy Shockey, and ex-NJ governor Jon Corzine. With a state-of-the art chef’s kitchen, a 10 x 12-foot window that gives you views over the Hudson River and a master suite with a huge walk-in closet, this luxury condo in New Jersey is definitely a winning combination. 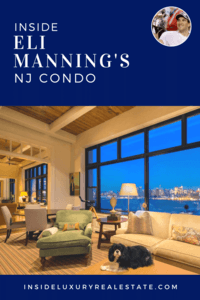 Manning and his family – his wife and three children – moved out of their luxury condo in New Jersey in 2014 into a $4.7 million home in New Jersey’s Summit, and also purchased an $8.5 million mansion on the waterfront in Quogue, in the Hamptons. It is reported that their Hamptons home was built in 2004 and it has a swimming pool, five bedrooms, a big deck, and private beach access. This Eli Manning home was previously listed for $5.2 million in 2015 but it was eventually sold in April this year for $3.3 million. The property was sold by a real estate agent with Douglas Elliman. If you liked this coverage of Eli Manning’s now former luxury condo in New Jersey, please pin and share it. Really can’t believe we have a $3 Million dollar home with a pet in the photo. The only I think of when I see this is that I’m going to be sneezing everywhere because of the dog hair.